Full of energy and ideas, Nancy is known for her sense of humour. Originally from Hull, Nancy moved to Lincolnshire 24 years ago to work as a practice manager for a GP surgery, where she met her husband, Tim, who was a GP at the practice and between them they have five children and eight grandchildren. Now retired, she keeps active cycling, growing vegetables, rearing guinea fowl and ‘growing her own turkeys for Christmas’ in her back garden. Her children call it ‘The Good Life’. Nancy also finds time to train dogs for obedience but one dog, Meg, embarrassed her at Crufts by falling asleep in the judging arena. She and her husband renovated a house in the south of France and her time spent there has influenced her baking. She made friends with a French chef with whom she discusses ideas and learns new techniques, and she pushed herself to improve her French so that she can read original French recipes. 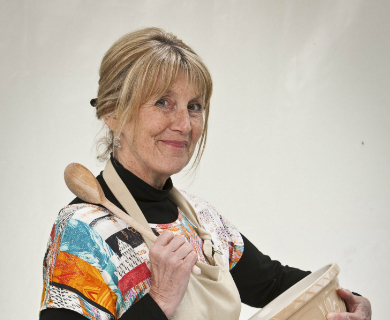 Nancy bakes to feed the family and reduce costs, she also genuinely prefers the taste of homemade baking. She wants to pass on her baking knowledge to her grandchildren and see them develop a passion for food and cooking. She loves to impart her knowledge to anyone who will take it, even teaching her hairdresser how to bake. How can you make a flawless cake? Read Nancy’s exclusive blog now.